Many visitors to Utah wonder about the large, Moorish building that looms on the south shore of the Great Salt Lake. Marinas and various industrial structures aside, it may well be the only commercial building on the lake. 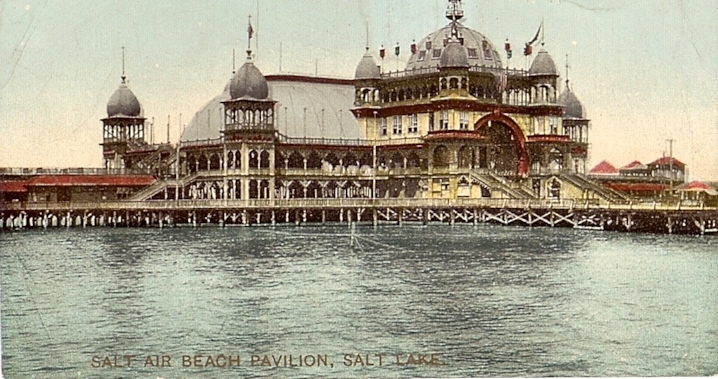 The building is Saltair– Saltair III, to be exact. It’s the third incarnation of the historic lakeside resort that was first built in 1893. You can read a beautifully written history of the “Lady of the Lake”on my friend, Gregory Navarro’s old geocities page. 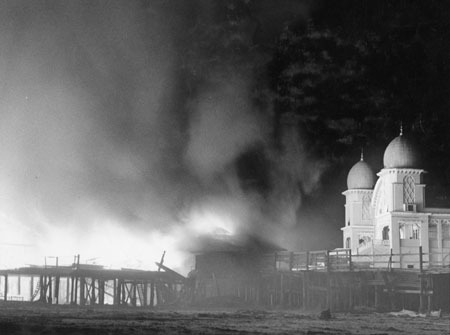 Fires dealt fatal blows to both of its predecessors, and Saltair III rose in 1982. For more convenient acess to Interstate 80, it was built off of exit 104 rather than on the original site. The original site sits quietly, abandoned and disheveled a full two miles northeast. 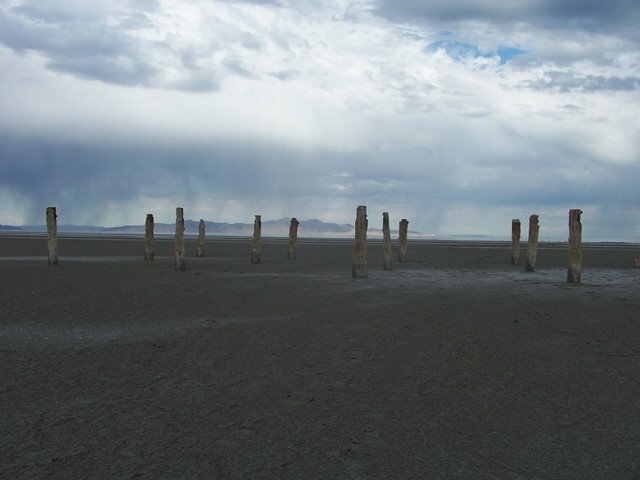 Last week, a traffic emergency during my commute home stranded me in the Saltair area for about 4 hours. 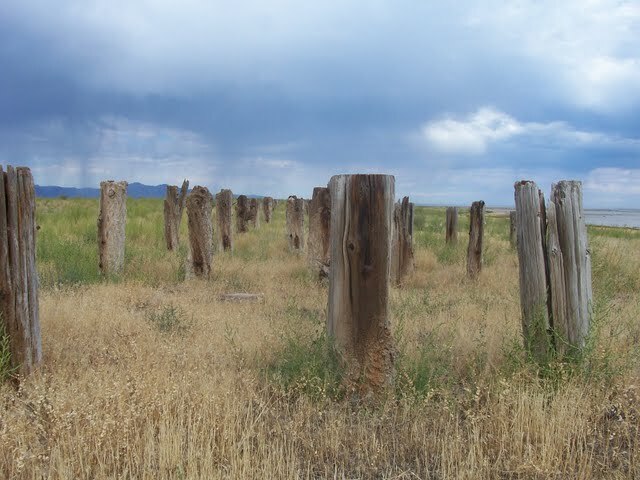 While many of my fellow traffic refugees stopped into Saltair III to wait for the freeway to reopen, I drove down to the trestle that leads about a mile offshore to the original site. 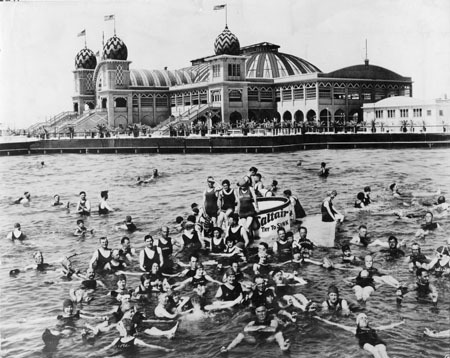 That outing will be the subject of this week’s Transcript Bulletin article, but here are a few pictures of old Saltair. Some of the older ones I don’t have credit info for, so I apologize to the various historical organizations they probably came from. The rest I took myself. Remains of a ceramic cup lie partially buried in the rubble of Saltair. 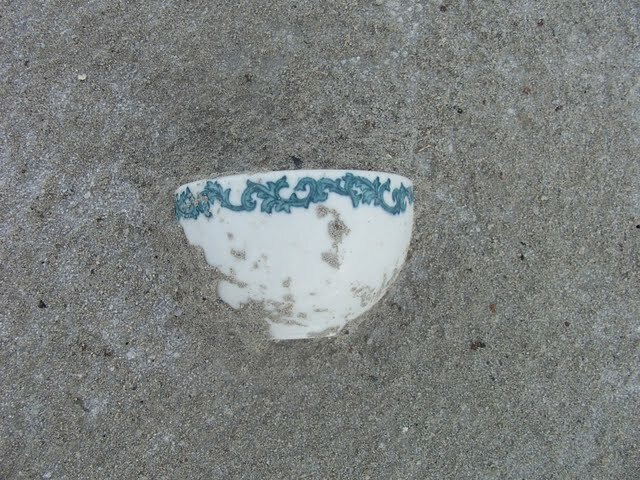 I found this cup on the site of the Ship Cafe, a seafood restaurant at the pavilion. My column about old Saltair will run in tomorrow’s newspaper. I’ll post it here sometime next week. I’m so happy that I found your blog! I have been working on a photo series of abandoned buildings and have taken a few images of an old trolley and marina building covered in graffiti that I found near the Saltair III. Your post has definitely been informative.. Thanks for stopping by, Amber! By the way, that graffiti covered building was an old power substation of some sort for Saltair. The trolley was actually one of the railroad cars that used to take people out there. Just FYI for the future, though, the area surrounding those is privately owned, and every once in a while people are ticketed for ducking that gate. Hi there. Great post. They have removed Train car 502 to the scrap yard, sad to see it gone. 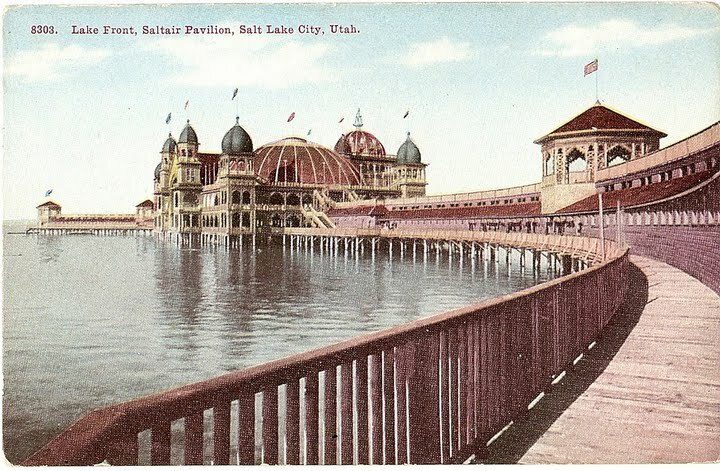 Your first two pics of Old Saltair are of the same Saltair I. Take a look at this blog “http://gorillasdontblog.blogspot.com/2011/02/saltair-utah.html” to see what Saltair 2 looked like. Saltair III has nothing to do with the originals except by name only. Its a old aircraft hanger that they tried to make look somewhat like the originals.